Named after Henry Hudson, a famous sea captain from the 1600’s, Hudson County, New Jersey combines a rich historical past with a thriving modern economy. As the fastest growing county in the state, young and old alike enjoy the convenient city access and countless entertainment options that this region offers. At Booth Movers, we understand why moving to Hudson County could be the ideal choice for you and your family, and we want to make the process as seamless as possible. With customizable Hudson County moving services and the most experienced northern New Jersey movers in the industry, our exceptional team is dedicated to keeping your next relocation on track. As the first choice for Hudson County moving companies, Booth Movers leads the industry with high-quality northern New Jersey moving services and customer care. Through an agency with Atlas Van Lines, our Hudson County movers are connected to a nationwide network of moving and storage professionals that are capable of handling any size relocation project – wherever in the world you need to go! From local moves within Hudson County to complex international relocations, our northern New Jersey movers can do it all! Through each stage of the process, Booth Movers will work with you to ensure that your move is as stress-free as possible, and we offer free in-home consultations to help you choose the Hudson County moving services that best suit your unique needs. Residential Moving – Take the stress out of your next residential move by having our Hudson County movers handle all the details! Household Moving – For any size household move, there is nobody more trusted than the professionals at Booth Movers. Local Moving – When it comes to moves within the Hudson County region, our northern New Jersey movers know the area best. Long Distance Moving – Planning a long distance move doesn’t have to be an overwhelming process when you have Booth Movers on your side. Interstate Moving – Moving to a new state can be a complex endeavor, and our exclusive Hudson County moving services can be customized to suit your needs. Full Service Moving – From full-service household packing to transport of high-value items, you can count on Booth Movers through each stage of the relocation process. International Moving – Our global network of moving professionals is capable of turning your international move into a seamless, expertly coordinated experience. 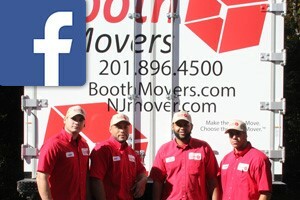 As the area’s most trusted northern New Jersey moving company, you can’t beat the value and service from Booth Movers. To find out more about the services that we offer, just give us a call today! You can also fill out our online form to connect with a moving expert and schedule your free, no-obligation consultation.